Merry Christmas Owners! 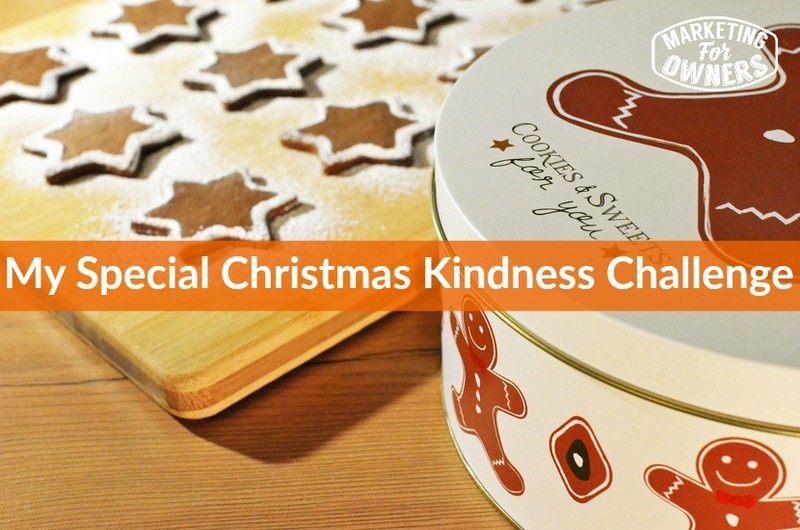 Today I am sharing with you my special kindness Christmas challenge. I love to celebrate Christmas in a special way, and if you don’t — that’s okay! I don’t normally podcast on Christmas Day, but I thought I would today. I am not going to go for the “peace on earth, good will to men” kind of podcast — that can be tricky even though it’s a nice thought. But — I do have a little challenge for you. Now — this can be used anytime of year, so don’t worry if you cannot get it done right now. You can consider this challenge for after Christmas. Most people make New Year’s Resolutions. How about a Christmas resolution? 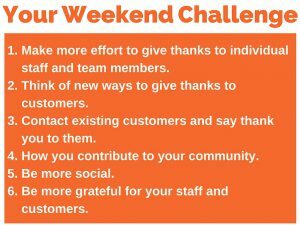 It’s a Christmas Kindness Challenge, which will help us improve our overall kindness to our staff, team members and our customers. If you can make that a habit, it will permeate through your whole being. You will get the results and you will find that it is actually worthwhile to be nice to people — especially if they are doing you a favor. Most of your customers and team members are doing you a favor — I bet you never thought of it that way? So — let’s get into this challenge. Grab your pen and paper and let’s start making a list of the things you are going to do in this challenge. 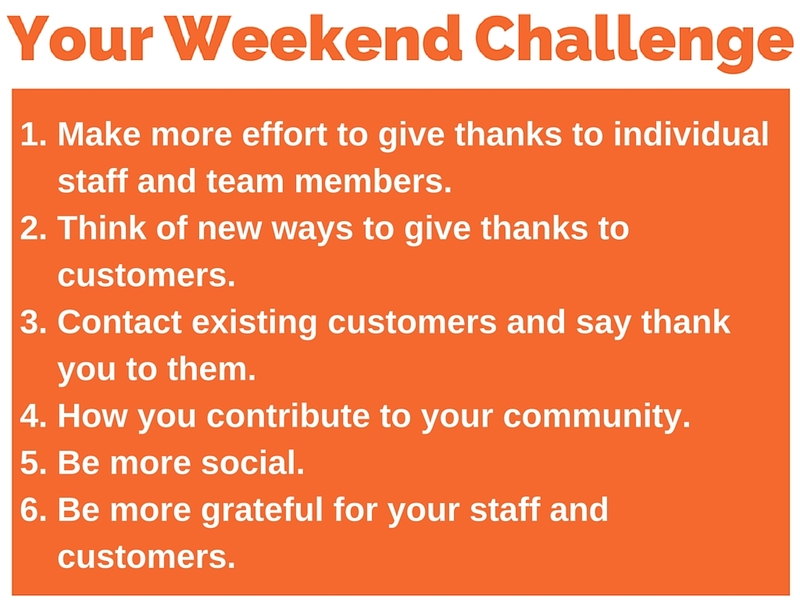 If you want more challenges like this, simply visit MarketingForOwners.com/challenge for a list of all of our Weekend Challenges. #1 Make More Effort to Give Thanks to Individual Staff and Team Members: What I mean by giving thanks is not giving them cash bonuses. I mean to be grateful, to take them aside — and when I staff, I don’t mean staff as a whole. Take an individual and tell them specifically why you think they are wonderful, how they helped on a specific task, and what that meant to you. There is nothing better than being told how grateful someone is because of the help that was given. Don’t just say, “I appreciate what you do.” Be specific. Tell them what you appreciate. #2 Think of New Ways to Give Thanks to New Customers: In my 6 P’s of Perpetual Sales Cycle, the 6th P is to develop preachers. We move from purchase to preachers. Now — what that means is you are going to have to impress your new customers. Don’t think your work is done because — it’s never done! You need to start working on them to make them buy again. You want to make them a permanent customer. The best way to do that is to show them how much their purchases from you mean. Think of ways you can do that. If you don’t have a lot of clients and you are in a service business, one of the best things you can do is go around and visit your clients and say hello and thank them for their business. That will be a surprise to them! Phone them up — you are the boss! What could be more important than talking to your customers? Now — you will make excuses as to why you can’t. They are your customers. Be more grateful for what they do for you. They could buy from anyone, but they chose you so say thank you. Don’t send an email either. If you want to get noticed, send a handwritten letter with a handwritten envelope. That will always get noticed. #3 Contact Existing Customers and Say Thank You To Them: With older customers, we tend to get complacent and think that just because they are buying from us, we don’t have to do anything else. Why not say thank you? Take them a gift such as chocolates, a bag of coffee, a fruit basket – or even have one sent to them that just says “thanks for your business”. Be sure to send it with a hand written note letting them know why you think they are wonderful. #4 How You Contribute to Your Community: Now, you may not understand how this plays in with your business, so let me tell you. For example — how about sponsoring a local kids’ sports team? You may think this is a marketing thing, but I bet you will feel good about it and it will help you to give back to the community. This will help you to get known and you will also be appreciated. People will realize that you are not all about the money. Rather than just you doing this, this is a company or a team thing. This is a company culture thing. Why not sit with your staff once a month when you talk about bits and pieces and bring up this subject? Ask them what they think as a company what “we” because it’s you and them — what you can do as a whole in the community to give back. Can we volunteer or organize something? Can we sponsor a soup kitchen or something like this? Just ask your team. People will have ideas and someone will probably volunteer to run and organize it for you. No– it’s not going to cost a lot, but it will certainly fill your heart and especially the people you are benefiting. #5 Be More Social: We all use social media, but the majority of the people I talk to seem to think social media is a pain in the neck. We feel that it is an overload. But how about putting a list in Twitter of your customers. Have one of your team members create this list and then communicate more on Twitter with them. If you don’t communicate with anyone else, communicate with those people who have spent money with you. Others will see you talking to them and thanking them publicly. You can recommend their business, thank them publicly and help them out. #6 Be More Grateful For Your Staff and Customers – Now this will improve your overall life. I used to think that staff were a pain. When I had my old fire business, I got to the point where I felt disgruntled with all of the demands and needs of my staff. Constantly they were coming to me asking for pay raises etc, and it just made me not like my staff very much. The problem was not them — it was me. I just did not know how to handle it. I should have known that this particular job should have been delegated to someone who was better suited to do it. Then when I started my newer business, Fire Protection Online, and indeed with Marketing for Owners, I understand that without my wonderful staff and team, there would be no company. The customers would not be happy. There would not be any customers. Without those customers, I would not need any staff. All of them can manage without me. It’s not about me, so I am grateful. Now, I get annoyed when I hear people complaining about their staff as a whole. I think to myself — do something about it. Talk to them. They are grown people. There must be some disconnect. Are you communicating with them? I get even more annoyed when people complain about their customers. The customer has the choice. If your customer is not nice — why not? Have you ever spoken to them asked why they seem so upset? Just be appreciative. I have a feeling if we appreciate everyone around us in life, then that will make this a joyous Christmas and that will develop into a fabulous 2016. Have a wonderful holiday and I will speak with you again on Monday. What can you do to be more kind?